Hello, everyone! How was your Christmas? I hope your celebrations were filled with family, food, and fun! As we say hello to 2017, I’d like to thank you all for making Kawaling Pinoy a part of your home cooking and to ask for your continued support in the new year. 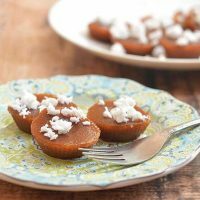 Please visit regularly for more delicious recipes, income reports, and fun giveaways! 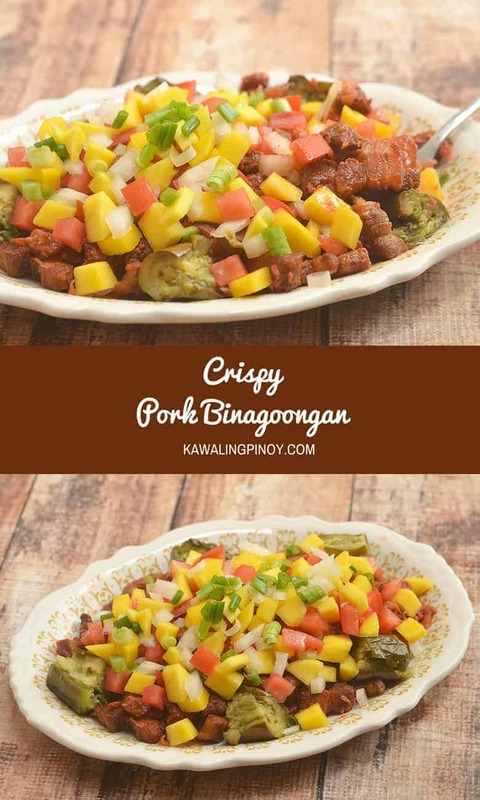 I was first introduced to this Crispy Pork Binagoongan when I did a promotional campaign for Goldilocks Bakeshop last July. It was one of their menu offerings I got to try for the first time and craved for regularly since. I just had to recreate it at home! 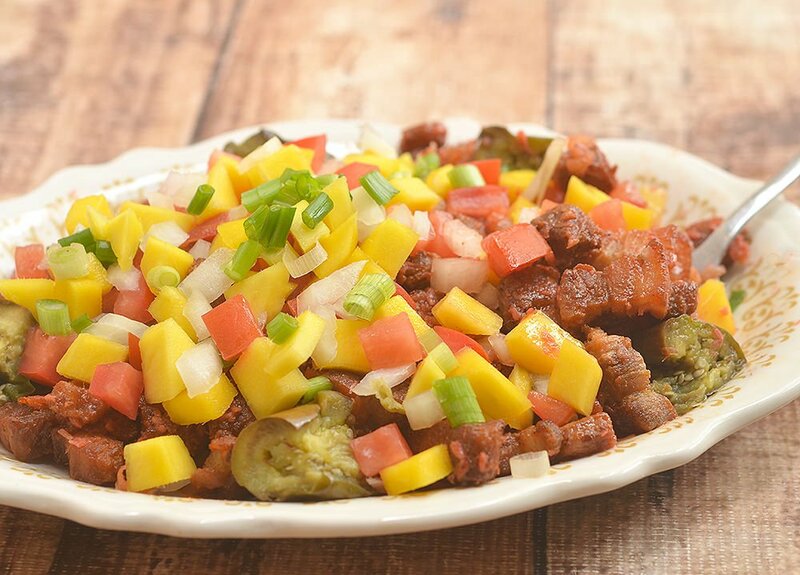 With crisp pork tossed in a pungent bagoong sauce and then topped with steamed eggplants, sweet mangoes, juicy tomatoes, and chopped onions, it’s an amazing revamp of our classic pork binagoongan. 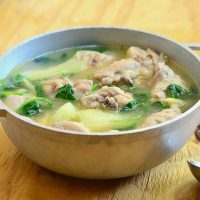 This recipe will be a great use for your leftover lechon kawali! 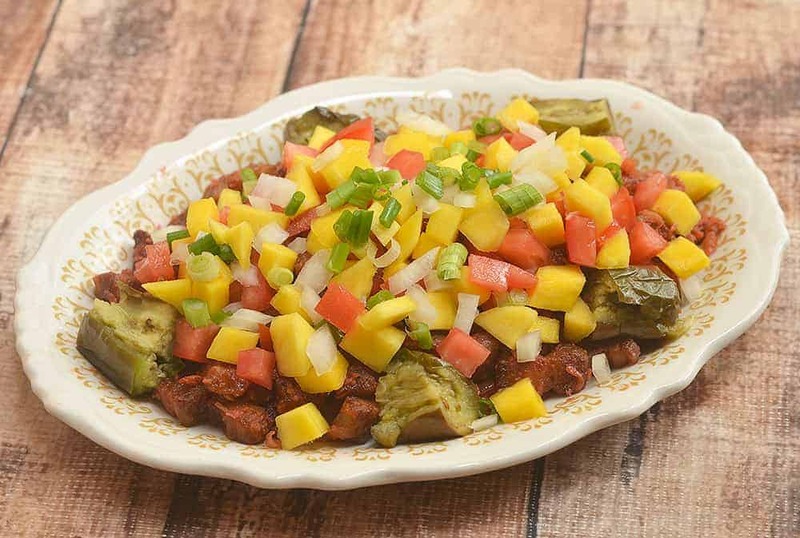 A huge part of the flavor profile of this dish is the sweet mangoes. Use ones that are adequately ripe and yellow but still firm. For super crunch, allow the pork to completely cool before deep frying. That’s it, folks. 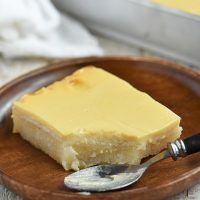 I hope you give this recipe a try, I am sure you’ll love it as much as I do. Enjoy! In a pot over medium heat, combine pork, salt and pepper to taste, and enough water to cover. Bring to boil, skimming scum that floats on top. Lower heat, cover, and cook until tender but not falling apart. Remove pork from pan, reserving about ½ cup of the liquid. Pat the pork dry and allow to cool completely in the refrigerator. Slice into 1-inch cubes. In a wide pan over medium heat, heat about 2-inches deep of oil. Add pork cubes and deep-fry until golden and crisp. With a slotted spoon, remove from pan and drain on paper towels. Remove excess oil except for about 1 tablespoon. Add the chopped onions and garlic and cook until limp. Add tomatoes and cook, mashing with the back of the spoon, until softened. Add shrimp paste and cook, stirring regularly, for about 3 to 5 minutes or until color darkens. Add ½ cup of the reserved liquid (pork stock) and sugar and bring to a boil. Lower heat and continue to cook for about 3 to 5 minutes or until slightly reduced. Season with salt and pepper as needed. Add fried pork and stir until just heated through. Steam eggplants. Discard stems and cut into cubes. 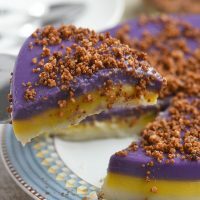 Arrange pork binagoongan on a serving platter. Top with steamed eggplant, diced mango, diced tomatoes, diced onions, and green onions. Serve immediately. 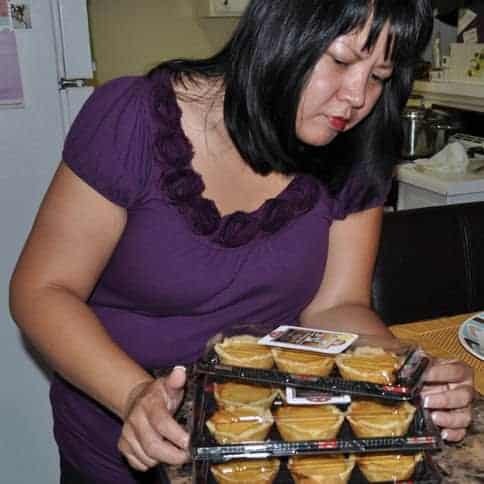 Thank so much, Sharon, for making Kawaling Pinoy a part of your holiday celebrations. I am glad you enjoyed the recipes. Have a blessed 2017!